After my birthday celebration last weekend my house is now filled with gorgeous bouquets of wonderful smelling flowers. Aromas of lavender, roses and lilacs linger in the air. Just beautiful. Although I cannot share these aromas with you, I can however, share a few visual impressions of these flowers. This particular bouquet was from my in-laws. My mum-in-law has the most awesome garden. These are her own roses and lavender that she lovingly put together to make a gorgeous bouquet! Dear Meeta, I love lavenders. There is something so magical about them in my opinion. I never had a lavender bouquet however. How wonderful must it have been!! What a lovely picture this is! Hey Meeta, Happy Bday!! Can you send me a link to the safety event round up? I love avender,in my garden I have two plants .I also use in some of my recipes . Hi Meeta!You have such a fantastic blog!I love the beautiful photo that you've posted.There cannot be a better birthday gift than gorgeous flowers.I love the fresh aroma of flowers more than any perfume.Wishing you a very happy belated birthday!Check my blog for interesting birthday details.Cheers! I hope you had a wonderful birthday. And it is always special to get anything from loved ones, isn't it? I hope you had a great day......I love getting flowers, it makes my home so much brighter! Lovely picture, Meeta as usual...this blog is eye candy for me! lavenders are my favoutite plants. they are both gorgeous and fragrant. what a sweet mum-in-law you have. Keep basking in the glow of your birthday hon, it's a wonderful feeling isn't it? Hugs. Great pics and a great bouquet Meeta. Hope you had a wonderful Birthday. Hugs! Lavenders are lovely.. Pretty to look at, divine to smell.. What is there not to love abt it? Gorgeous photo - as usual! Hi everyone, nice to know some of you share my love for lavender too. Loved all your wonderful feedback on the photo. I just found your website, what is my impression about it? LOVE it very much! 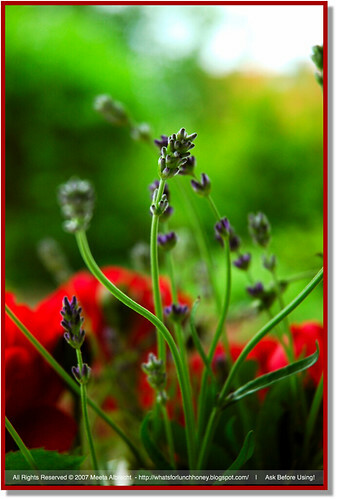 About lavender, it is always one of my fav flowers. You took a beautiful picture. Just want to let you know I link your web on my web. I am just a begginer with blog.